We are here to help and offer FREE services. We have qualified, competent and friendly Employment Counsellors. Come and meet with us. 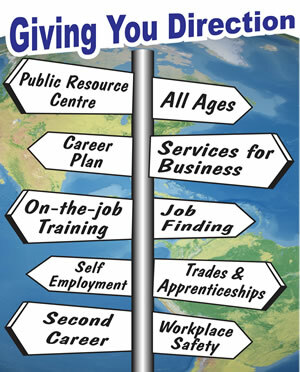 TRACKS has specialized services and programs to help you with your employment needs. Whether you are employed, unemployed, starting your career, a mature worker, looking to change careers or contemplating your next steps, TRACKS can help. Our employment services are flexible and driven by your needs. You can choose to have TRACKS assist you with your employment goal or just use our Resource & Information Centre for unassisted support. Our employment counsellor’s can assess your needs and help you put a plan together so you can reach your employment goal quickly. Our councellors are experienced professionals with expertise in diverse occupational areas. We can assess your marketable skills, identify labour market opportunities and determine appropriate services and resources to move you closer to your goal. Our services extend beyond just helping you find a job. We help you succeed at work so you can maintain your employment. TRACKS offers coaching, mentoring and if required, additional supports. *Some services are subject to eligibility and suitability. Call TRACKS Employment Services at (705) 444-1580 or drop by the office at 50 Hume Street in Collingwood.